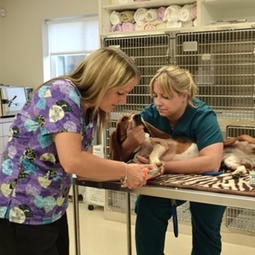 Appointments are available with our pet tech/nursing staff for minor procedures, that do not require a doctor's expertise. Available are basic nail trims, weight checks, Home Again Microchip ID, flea & tick checks & applying flea & tick medications, etc. For pets who are up to date on their doctor exams, services such as heartworm tests, booster vaccines, and some blood tests & dewormings can be done by a tech. There is no office visit fee for technician appointments during regular technician appointment hours.